Great if you need a small tumble dryer. Rated 4.7/5 from 291 reviews! This White Knight 372 compact vented tumble dryer is a modern, front loading white tumble dryer with a 3kg capacity for drying small loads. This tumble dryer comes with 2 heat settings and a 140-minute timer. The White Knight 372 comes with mobility wheels, allowing you to position it with less effort. It has an easy access fluff filter and includes a vent hose. 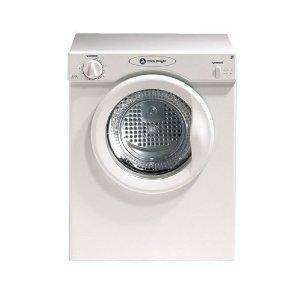 This White Knight tumble dryer has 2 heat settings plus a final cool cycle. It has a D energy efficiency rating and a noise level of 62dB. This White Knight 372 compact vented tumble dryer is a modern, front loading white tumble dryer with a 3kg capacity for drying small loads. This tumble dryer comes with 2 heat settings and a 140-minute timer. The White Knight 372 comes with mobility wheels, allowing you to position it with less effort. It has an easy access fluff filter and includes a vent hose. This White Knight tumble dryer has 2 heat settings plus a final cool cycle. It has a D energy efficiency rating and a noise level of 62dB. They'll take your money & cancel it ! thats what i was thinking ordered loads from tesco last week everything got cancelled even non reduced items took my money and taking there time giving a refund ! why would this get cancelled ? Same here , I wouldn't buy a fart from them now as it would probablyblow away in the wind like all their recent so called deals . Why did all the recent legitimate deals get cancelled ? Not the so called " mis-price " ones but others that were genuinely bought with expectation of delivery . Tesco , every little doesn't help at all nowadays . I have made my shopping simple anything tesco or comet ,I don't bother to shop. bah, I really need one of these! Same here , I wouldn't buy a fart from them now as it would probablyblow … Same here , I wouldn't buy a fart from them now as it would probablyblow away in the wind like all their recent so called deals .